God did not create the universe, Stephen Hawking revealed yesterday. In the flurry of publicity preceding his new book, The Grand Design, to be published next week, he does some serious disusing of the Almighty, declaring him/her/it irrelevant. The point is, he says, that our universe followed inevitably from the laws of nature. But, we might ask, where did they come from? Do you believe in the existence of God? Your answer might be: Of course not, I am a Scientist. God to most scientists is mathematics hidden in the law of Nature. He might say that the world of things is nothing but bits and pieces of mathematics. Again, we are connecting bits of information with mathematics, i.e., the quantitative information of an event. God is not quantifiable or provable in the sense of experimentation and/or observations. In the previous three volumes, this quantitative-mathematical attitude has been expanded to the qualitative-pictorial side of science, to look at logic-information from the qualitative notion of numbers, and to employ a notion of informational dimensions rather than that defined in the geometry of space-time. This volume further expands this extension to include the qualitative logic on the existence of God, which is a Creator of the logic component of matter. Let us be specific about the scientist’s view of God. To do this, I shall select one physicist’s view to be representative of this subject. I will pick a physicist with authority, whose answer is respected by most other scientists. This physicist is Stephen Hawking, who is considered by most to be an intellectual genius. His view is quoted in the following answer to the two questions asked of him. SUE: To oversimplify your theories hugely, and I hope you’ll forgive me for this, Stephen, you once believed, as I understand it, that there was a point of creation, a big bang, but you no longer believe that to be the case. You believe that there was no beginning and there is no end, that the universe is self-contained. Does that mean that there was no act of creation and therefore that there’s no place for God? STEPHEN: Yes, you have oversimplified. I still believe the universe has a beginning in real time, at a big bang. But there’s another kind of time, imaginary time, at right angles to real time, in which the universe has no beginning or end. This would mean that the way the universe began would be determined by the laws of physics. One wouldn’t have to say that God chose to set the universe going in some arbitrary way that we couldn’t understand. It says nothing about whether or not God exists – just that He is not arbitrary. SUE: But I think that many people do feel you have effectively dispensed with God. Are you denying that, then? STEPHEN: All that my work has shown is that you don’t have to say that the way the universe began was the personal whim of God. But you still have the question: Why does the universe bother to exist? If you like, you can define God to be the answer to that question. The above is taken from Sue Lawley’s 1992 interview of Stephen Hawking. Hawking proposed that in imaginary time, the histories of the Universe are closed surfaces like that of the Earth. The Universe would be entirely self-contained; it would not have to be specific or possessing any boundary condition at all. It wouldn’t need anything outside of the Universe to “start-up” the evolution process and set it going. Thus, for Hawking the question: Does God exist is not the problem. The problem is: Why does the Universe bothers to exist? For Hawking, embedded in imaginary time, the Universe has no beginning or end and thus bypasses the question of the Universe’s beginning. But, without a beginning, there still has to be a Creation, otherwise we humans wouldn’t be here to see it. In fact, the Creation had to be so specific that we humans are here to ask this question about the existence of a Creator. So Hawking didn’t solve the Creation problem by formulating the trajectory of the Universe in the mathematics of imaginary time. As a matter of fact, the Universe is open, even though its trajectory forms a closed surface. The Universe is open according to Bell’s non-local principle. You can say that the Universe is closed; yet it is open. It is nothing; yet it is everything. It is closed perhaps because Hawking’s mathematics said so. It is open because of the non-locality condition. It is also open because it violates the 2nd law of thermodynamics in real time, which states that all closed systems are unstable. The Universe has to be stable, at least up to now; otherwise we wouldn’t be here to see it. The Universe is nothing, because we have no way of decoding the logic of its non-local existence inside the vacuum. It is everything when we know the key to its non-local existence. What is this logic of non-local existence? This is not the initial or the final conditions of a trajectory defined in a space of position and momentum. This is the set of logic that defines space, time, elementary particles, motion, and so on, as formulated in Volume 2. Therefore, it is not a question of asking whether the Universe has or does not have a beginning, which defines its existence. The answer to the question of existence is hidden in the answer to: What is the first set of logic? Remember, logic is a component of matter besides wave and particle. There is no beginning state, nor an ending state, that connects us to this question for logic is a non-local state. In fact, as discussed in Volume 2, there is no such thing as time. The time referred to as the past is stored in history. The time referred to as the future is stored in a logic-state of finality. The time that is the Now is imaginary time, which is a teleportation operator that connects our visible universe to the invisible universe of non-local logic. NOW is the “thing”, which connects knowing by reasoning with what I call non-local knowing in the Holon Theory. The former is by reasoning of learned knowledge, the mathematics that Hawking and other scientists talk about. The latter is spirit knowing, which connects with the notion of faith. That is to say, it is in connecting learned knowledge with faith that we ask the question: Is there a Creator? In learned knowledge, in any happening, there is a cause and an effect. In faith, things can happen without any cause or effect. In faith, things happen non-locally, which is outside of space and time. This phenomenon has been explained in Volume 2. In short, faith knowing is non-locally connected to knowledge beyond learned knowledge. Remember, when we, including physicists, talk about the universe, generally speaking, we mean the visible or the observed universe. We are not talking about the logic universe. It is inside the logic universe that one must ask the question about the existence of God. With this introduction, let me post the answer to this question about the existence of God within the notion of Godel’s Theorem. Let us examine the argument about God’s Existence using Godel’s Theorem. Godel’s Theorem states that if we use a closed set of hypotheses (closed implies knowledge obtained within this Universe) to describe this Universe (in Godel’s case about logic) and say that this set of hypotheses (logic) is complete in explaining everything about this Universe (in Godel’s case everything is about logic), then this set of hypotheses itself is contradictory. In short, if we examine the Universe from inside using these hypotheses, our knowledge will never be complete; and if we claim it to be complete, then this knowledge is self-contradictory. Therefore, in order for us humans to understand this Universe completely, we need to possess knowledge not only from within; but also, from outside the Universe and this knowledge can only come from the outside. From within implies knowing by learned knowledge. On the other hand, from without corresponds to faith knowing, or non-local knowing, connected to knowledge beyond learned knowledge. Thus, Godel’s Theorem joins together faith with objectivity. This non-local connection is discussed in Michael Guillen’s book, Bridges to Infinity, and is quoted below. Until about fifty years ago, truth to a mathematician had been synonymous with logical proof. A hypothesis was true if it could be proved with logic and false if it could not be. For this reason, mathematicians had operated in a fantasy world, one in which nothing was left to faith because everything could be proven to be either true or false. By contrast, the world familiar to the rest of us is one in which faith assumes a major role in deciding truth. In 1931, however, the mathematician’s fantasy world became like the more realistic world when the Viennese logician Kurt Godel proven that there will always be mathematical truths that cannot be proven with logic. Suddenly, there was introduced into the mathematical world a formal role for subjectivity, since the only possible way of avowing an unprovable truth, mathematical or otherwise, is to accept it as an article of faith. Therefore, mathematical logic and logic of faith is connected at the time of Now, or by this imaginary number i [=(-1)1/2], which Hawking calls imaginary time. In conclusion, I can now say that the answer to this question on the existence of a Creator depends on the individual who asks the question. This is dependent on the degree of the individual’s faith knowingness. I might even go as far as to say that for the individual to even ask this question also depends on the degree of this individual’s faith knowingness. Even knowing by learned knowledge is dependent on the individual who would ask this question about the Creator. This dependence also has to do with the individual’s degree of learned knowledge. Thus, as expressed in quantum physics, this Universe is a participatory Universe. Nothing is real until a successful observation is made. Or from the perspective of the Holon paradigm, as discussed in Volume 3, soul perception and spirit knowingness are observations of faith knowing. This is the reason why I use Hawking’s answer, which is full of learned knowledge, to represent the scientists’ answer to this question about the Creator. 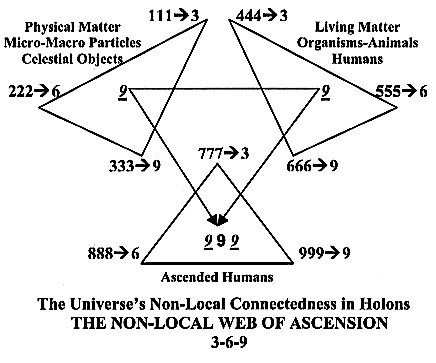 This Web of Ascension Logic has been fully discussed within this Website.